Personalised Navy Bath Sheet. Navy Blue Bath Sheet made from 500GSM cotton embroidered with a name of your choice in a colour of your choice. A unique and useful gift. A unique and useful gift. Popular for birthdays, wedding or anniversary gifts, beach holidays and even a great housewarming gift. This large bath sheet sized towel is 100% soft cotton. A fantastic extra large size that is handy in the bathroom and also can be used at the beach or as a swim towel! 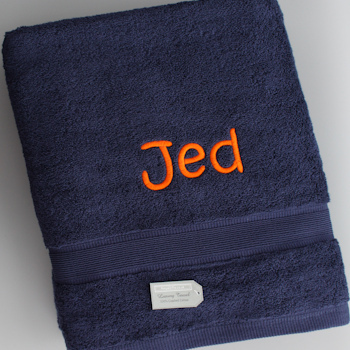 Fill in the option box and have this towel made extra special - personalised with your choice of embroidered text, a nickname, first name or initials monogrammed in a coordinating thread colour of and font style of your choice.